Editor's note: The SABR Salute, first bestowed upon writer Fred Lieb in 1976, was designed as a manner of recognizing the contributions of some of the older members of the Society. Subsequent SABR Salutes appeared in the SABR Membership Directory and honored members who had made great contributions to baseball historical research. 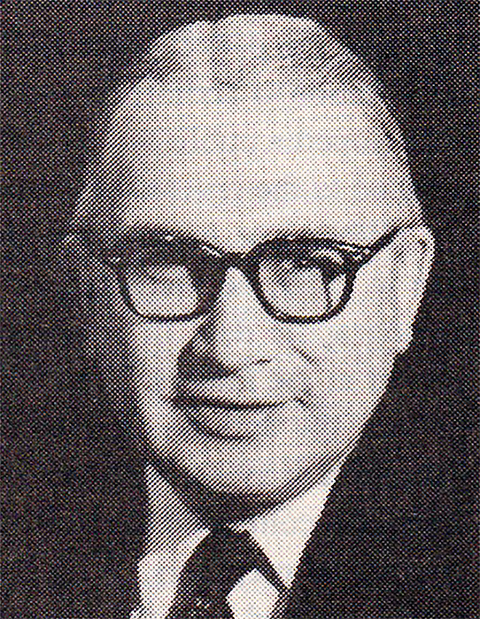 Harry Simmons received the SABR Salute in 1990; the following biographical sketch appeared in that year's membership directory. Pick up any issue of Baseball Digest and you see a one-page feature entitled So You Think You Know Baseball?, by Harry Simmons. Could this be the same Harry Simmons who published articles in Baseball Magazine a half-century ago, and ran a similar feature in the Saturday Evening Post from 1949 to 1961? Yes, this is the same diamond devotee, now 82 years old, whose baseball contributions have been quietly demonstrated in several different fields. Harry Simmons was born in New York City on September 29, 1907. His parents were immigrants from Russia and Poland. His father worked in the garment industry and the boy did various odd jobs to help out. The first baseball game he remembers seeing was a Sunday clash between the Yankees and Senators at the Polo Grounds on May 11, 1919. He remembers 12 innings before it was called. He did not realize until years later that the Yankee right fielder and leadoff batter, who went 0 for 5 against the Big Train, was George Halas. Harry graduated from Morris High School in the Bronx and worked in several uninteresting jobs while developing a deep interest in baseball statistics and history. In the 1930s he made his first contact with Ernie Lanigan, the baseball historian and Information Director of the International League. In 1939 he became Lanigan’s assistant. By this time he was well into baseball research, of which the International League was only a small part. His biggest project was compiling 19th-century National League won-lost records for pitchers. Ironically, the guides had not published this vital information for much of that period. He carefully checked each box score in the pertinent newspapers, Sporting Life, and The Sporting News, and published the results over several issues of Baseball Magazine. He also remembers an article he wrote on “Baseball’s Forgotten Immortal,” which dealt with the major contributions of Harry Wright. At that time (1940-42), Fred Waring and His Pennsylvanians had a popular radio show in New York which included a salute to the top baseball performer of the day. Harry was paid $5 to make the daily selection based on a quick analysis of game write-ups. The results would be announced with radio fanfare and a “Hats off to” — Joe DiMaggio, Bucky Walters, or some other star of the day. Unfortunately, those big paydays didn’t last very long as Harry went into the Army in 1942. He was assigned to several coast artillery sites stateside. He particularly enjoyed Camp Pickett, Va., because on weekends he would “camp” at the Library of Congress in Washington. There he would compile all kinds of interesting historical data on baseball and ship it off to Taylor Spink at The Sporting News. Included would be 1876 records, debuts of prominent players, batting records of pitchers, rare fielding gems, etc. Other items were sent to Leonard Gettelson for revision of the TSN record book. He also began to contribute material to Hy Turkin and S.C. Thompson for the Barnes Encyclopedia which would be published in 1951. After the war ended in 1945, Harry returned to his job in the International League office. The next year Lanigan left to become Hall of Fame historian and Harry became League Information Director. Later he was named Secretary. He served 15 years under Frank Shaughnessy and five under Tommy Richardson. The office was moved to Montreal in 1953 and Harry continued as a Canadian resident until 1966. He recalls 1946 as his most exciting year, particularly because of Jackie Robinson’s precedent-setting tour around the circuit. He still remembers manager Tommy Thomas of Baltimore calling to say, “There’s going to be trouble here.” However, most of the racial problems were smoothed out. In 1951 Harry the historian testified before a congressional committee on the history of the reserve clause. However, he was most recognized as an expert on rules and for his innovative talent as a schedule maker. Having International Leagues franchises as far apart as Ottawa and Havana was a real challenge but he was up to it. In March 1953 when the Braves deserted Boston for Milwaukee, Warren Giles called Simmons for some hurry-up scheduling advice. The latter recommended a new east-west balance by giving Pittsburgh’s schedule to Milwaukee, and Boston’s to Pittsburgh. This prepared him for the major shifts and expansion that took place in the 1960s and 1970s. It was Simmons who came up with the formula to equalize batting champion eligibility for major and minor leagues which played different number of games. He figured it should be 2.6 at-bats per scheduled game, which for the majors was 400 at bats per 154 games. Later it became 3.1 plate appearances per game. He got in the news in August-September 1980 when George Brett was compiling a near .400 batting average but barely achieved the necessary 502 trips to the plate. In 1966 Harry moved to the Commissioner’s Office where he served as player contract administrator, schedule coordinator, and historian. At the December 1979 major/minor league winter meeting he was honored as “King of Baseball.” He and his wife, parents of four, live in Stamford, Connecticut. A SABR member since 1974, he continues to supply solutions to knotty problems as carried in the monthly feature in Baseball Digest. Whom did he admire most along the way? Probably Ernie Lanigan, who gave him his first baseball job. He also has a moderately kind word for Commissioner Landis, who he feels has not been given a fair shake (compared to Chandler) in regard to integration of baseball. But that’s another story.